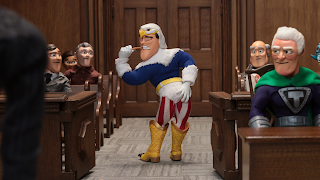 An all-new episode of Sony Crackle’s Emmy®-nominated stop-motion animated adult comedy series, “SuperMansion” is now available to stream for free today, Monday, May 21. In episode 303, “My Cousin Kitty,” Cooch's former owner, Claudette (Jillian Bell), returns with a shady lawyer demanding her cat back. Robobot (Zeb Wells) represents Rex (Bryan Cranston) in the trial of the century (his words, not ours). Meanwhile, The Groaner (Zeb Wells) searches for the true origin of Black Saturn's (Tucker Gilmore) name. 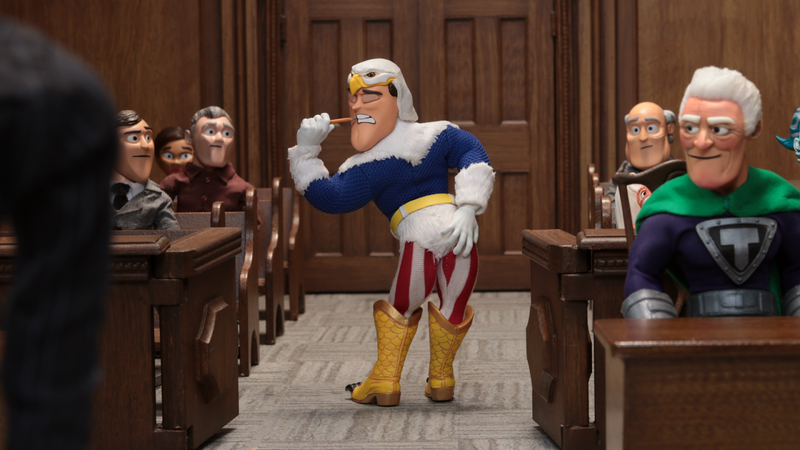 In season three of “SuperMansion,” the lunatics get the keys to the asylum when Dr. Devizo (Chris Pine) is declared a hero after “saving the world” at the end of last season. He and the Injustice Club are all made honorary members of the League of Freedom. The heroes and villains must learn to live and work together if they’re going to combat the never-ending amount of evil in the world. Today is also the last day that fans can enter the “SuperMansion” sweepstakes, in partnership with Xbox Live, for an opportunity for one lucky winner and their guest to win a trip to Los Angeles, CA. The prize also includes a behind-the-scenes tour and look at how the hit stop-motion animated series comes to life at the show’s production headquarters, Stoopid Buddies Studios, and more. Fans can enter to win here by tonight at 11:59 p.m. PT. Subject to Official Rules. Sony Crackle also launched an official “SuperMansion” Giphy page where fans can post their favorite GIFS from the show. “SuperMansion” stars Bryan Cranston (“Breaking Bad”), Keegan-Michael Key (“Key & Peele”), Chris Pine (“Star Trek”), Jillian Bell (“22 Jump Street”), Yvette Nicole Brown (“Community”), Heidi Gardner (“Saturday Night Live”), Tucker Gilmore (“Frozen”) and Zeb Wells (“Robot Chicken” and also writer). Breckin Meyer (“Clueless”) will also return as Courtney and Oscar and Emmy-nominated actress Minnie Driver (“Speechless”) will have a recurring role on the upcoming season. “SuperMansion” is created by Zeb Wells and Matthew Senreich, who also act as executive producers under their production company Stoopid Buddy Stoodios alongside Seth Green, John Harvatine IV and Eric Towner. Bryan Cranston and James Degus also serve as executive producers under their production banner Moonshot Entertainment. The series is directed by Nick Simotas (“Back at the Barnyard”) and distributed by Sony Pictures Television Inc.